prepare them the same way as zucchini. In the end, between scraps of information, intelligence in other people's kitchens and experiments in my I got this recipe; It will perhaps not be the original one, but the result, according to my various diners, is impeccable. A little note: the photographic sequence is not complete, I always forget to update it, make it up to the next frying. Clean and slice the aubergines in fairly thin slices. Sprinkle them well with salt and put them in a colander with a heavy plate on top to make them lose the bitterness and excess water inside. After at least an hour, rinse the aubergines and dry them well with a cloth. Prepare the batter by mixing in a bowl, better with a whisk, water and flour; continuing to mix add egg, oil, brandy, salt and pepper. Heat the oil in the fryer. 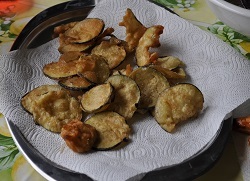 Dip the eggplant slices in the batter and then immerse them in oil hot beautiful (the ideal is to put them one at a time so they do not remain stuck - or just separate them immediately immersed). As soon as they are well browned on both sides, drain them well and place them on a sheet of kitchen paper until they are all ready. Sprinkle with salt and serve while still warm well: they are delicious! Nothing better to accompany this frying, a beautiful bowl tzatziki. Wanting to avoid the use of brandy (or other alcohol) you may be used in an ammonia ct for sweets [(NH4) HCO3], It is also found in the supermarket.